This summer, elementary students had the opportunity to learn more about where their food comes from at the Ground Works-Midwest Youth Eating Smart (YES!) Summer School Day Camps. Ground Works-Midwest is a grassroots community development nonprofit organization with the mission to provide innovative education resources to elementary and middle school teaching gardens through the use of school gardens as a teaching lab for students. The YES! day camps were held in July and early August at Hayward Elementary, Lennox Elementary, Mary Jo Wegner Arboretum, and Dell Rapids Elementary. Participating students had the opportunity to pick vegetables from the Ground Works-Midwest Teaching Gardens and prepare healthful meals that they can easily make at home as after-school snacks or packed lunches. Holly Swee, RD, LN, South Dakota Beef Industry Council (SDBIC) director of nutrition and consumer information, was on-hand at the day camps to offer recipe ideas for including healthy beef in the diet of active, growing kids. "During the camp, the kids made a wrap that included deli roast beef, vegetables, hummus and a whole wheat wrap," said Swee. "They also deconstructed a cheeseburger, and they learned how each ingredient in the burger comes from agriculture." YES! is a new program of Ground Works-Midwest, and the day camps are geared around USDA's MyPlate and encouraging kids to make smart eating decisions to help fuel their days. Swee says beef fit perfectly with MyPlate's guidelines and encouraged the students to find ways to "beef up" their meals. "Beef is one of those animal proteins that offers all of the essential amino acids that are so important for growing, active kids," said Swee. "The zinc, iron and protein, among other nutrients beef provides, are so vital for kids' growing bodies, and those nutrients are sometimes hard to get from other foods. 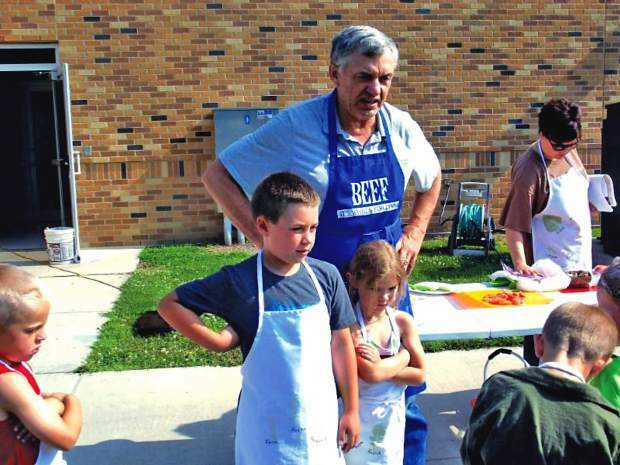 The demonstration was a great teaching lessons for kids to learn about how to make healthful meals, as well as a good reminder for parents to think about choosing beef more often for family meals to get some of those important nutrients that beef offers." After preparing and sampling the beef recipes, the students were sent home with additional recipe ideas and a cookbook for parents. Former South Dakota Agriculture Secretary and Ground Works-Midwest Board Member Walt Bones also volunteered at the day camp to help share the agricultural story with the participating elementary students. For more information on Ground Works-Midwest, check out http://www.groundworks-midwest.com. To learn more about projects of the Beef Checkoff Program, see http://www.sdbeef.org. For easy after-school meal ideas for kids and active families, follow SDBIC's blog, sdbeefblog.wordpress.com/2012/08/.